What a sweet happy life it is! This is what Port Huron does to me - it inspires me! 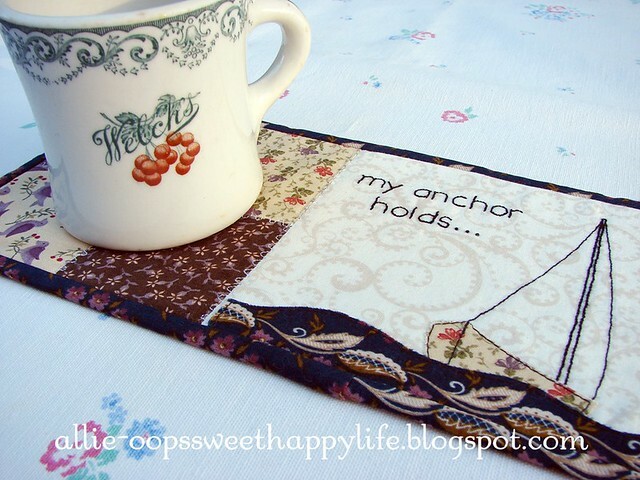 My Anchor Holds is a new mug rug pattern in my store here>: Allie-oops Designs - love the instant download from craftsy! It's a quick and easy project, quick enough to make for anyone you know who might be going through the storm. I used some leftover scraps from a charm pack, don't you love being able to use up some scraps! My scrap pile has diminished by .000000000000000000001% now. I've included already reversed templates for your convenience, a layout diagram, and step by step instructions with photos throughout. Also, the words to the hymn, which I find so inspiring. I tried to embed a youtube video to a contemporary version, but it didn't work. So here's the link to a young lady with a beautiful voice, singing this hymn! Lovely, and your coffee mug fits so well with the fabric and design. ROTFL @ the scrap reduction of .000000000000000000001% - I know the feeling, lol! Pretty pattern! It's beautiful! what a great way to use up all those scraps. LOL! I need that exact fabric that you use for the ocean. ahoy my hearty!! 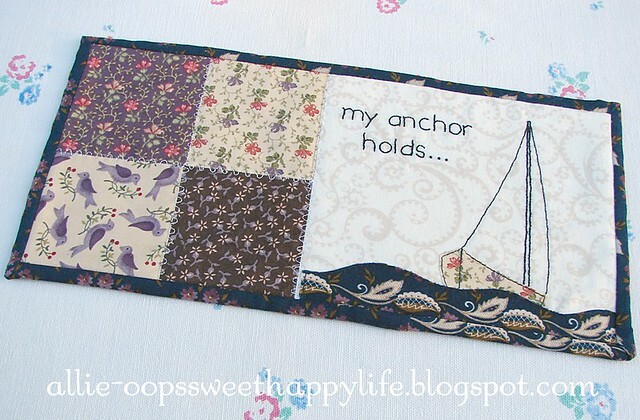 That's such a gorgeous mug rug, perfect for sailing day dreams while sipping coffee. Love your mug rug! Great job! Wonderful design and love the saying, always love pieces with inspirational sayings. One of these days I will start designing some quilts, I do have fabric with seagulls and things to make a ship quilt for the summer. This is wonderful!! So calm and peaceful. I love the way the print mimics the waves of an ocean. Great choice of fabrics especially for those waves! the fabric you used for the water is perfect. Join my Stitching Group on Facebook! Here's where I'll upload free designs! If you're a MI quilter and would like to use this picture, feel free! Just copy and paste into your blog sidebar.